As always Trial Magazine tries to bring you the best in machine tests with our extensive comparison reports. This time we decided to try something completely unique. We take a new machine from Beta, Gas Gas, Montesa, Scorpa, Sherco and Xispa. We then enter one rider in the Scottish Six Days Trial. He then rides each of the six days on one of the machines provided – the ultimate test! You’re probably thinking: are we crazy? Last year my good friend Nick Shield and I were having a nice relaxing drink (beer of course) at the Richmond Three Day Trial held near Richmond in the Yorkshire Dales. I suggested that for this year’s SSDT we try something new. Nick is a regular rider and winner at all levels of trials; from twin-shock to modern machines, he rides them all. He has also owned many different brands over the years and ridden in all the events you need to ride in, including World Championship rounds (he has reminded me this was many, many years ago). I suggested we carry out the ultimate trials bike test at the 2009 Scottish Six Days Trial. I suggested Nick could be the rider (he smiled!) After a few more drinks the idea seemed like a really good one and we shook hands on the decision to proceed with the idea. I then approached the organising club for the Scottish, the Edinburgh and District Motor Club. The always helpful secretary of the event, Mairi Jenkins, said she would put the proposal for the test to the committee, who were more than obliging. Nick would ride as number 278 and would be included in the event just like a normal entrant but on a different machine every day. Now that we had an entry I had to contact all the UK importers of the machines for the test. They were all enthusiastic and with the promise of support from the clothing and boot suppliers it was game on. The importers all suggested it would be a good idea to prepare the machines themselves as the Scottish is such a tough event, and where needed small changes would be made. They also agreed to use the machines in a local event just to free them off from new due to the fact that the machines would be straight into competition. To make the allocation for each day’s machine I enlisted ACU man Dave Willoughby to make the draw so as to show no particular favouritism to any manufacturer, although the truth is all the days in the Scottish are hard ones. January 2009 soon came around and I was on the phone to Nick to order him to the gym and start to get himself in shape for this great adventure. 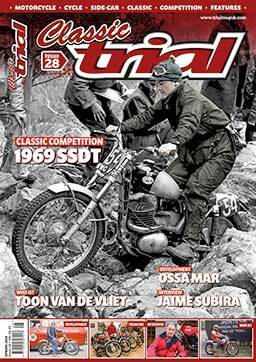 The SSDT runs from 4th – 9th May. With all the arrangements in place I headed to Fort William, Scotland for the event’s proceedings. With Nick in fine form and ready for action we checked that all the machines had arrived. The days and machines are as follows: Monday – Scorpa 250cc SYF four-stroke; Tuesday – Beta Evo 250cc 2T; Wednesday – Gas Gas 280cc TXT Pro; Thursday – Xispa 250ccR; Friday – Sherco 250cc; and finally Saturday with the 250cc Montesa 4RT. A superb selection of machines and for me a good one as the week began and ended with a four-stroke machine. With all the machines lined up and ready for the off I was quite excited that the whole project had come to life. Nick would ride the Scorpa in the parade through the streets of Fort William before putting the machine into Parc Ferme on the Sunday, where it would stay until the start of the Trial in the morning. As Trial Magazine has all ready tested all the machines we are using in previous issues, I decided to give the machines a score on a rating of 1 – 10 with 10 being the best down to 1 for the worst. There are no bad machines and I have done this evaluation of each machine as fairly as I can. Helmet: Hebo – Clothing: Hebo – Boots: Hebo – Waterproofs: Hebo – Goggles: Scott. With no let-up in the rain it was once again going to be a difficult day’s trials riding. With the route changed from last year and a new off-road section included early on, the day’s proceedings already looked quite testing. With the day’s new route never having been ridden before I took the advice from the Gas Gas support crew and let them fit me one of the larger size fuel tanks which were been used by the “works” team and quite a few of the private entrants. These are available for anybody to buy and fit, and a must to give you that peace of mind in these long-distance types of events. As they are made to replace the original fuel tank they do not interfere with the machine’s handling or riding position. After the short road ride to section number one near the famous Ben Nevis ski lift the rain was once again coming down pretty heavy. The sections here were straight up and over the large boulder-strewn river. This immediately highlighted the machine’s ease of riding. The machine is very small and nimble and the crisp power delivery made it a pleasure to ride. I rode the two sections for the odd mark which was a good start. It was then another road ride but much longer for the new loop. The ride over the moors on this part of the course was quite difficult and highlighted two main points on the machine. The rear mudguard does not do a very good job of keeping the elements off the rider. The other point is how comfortable the riding position is. It was then back to the road and the lunch check at Fersit Bridge. The sections at Fersit made me realise how much the river levels were once again rising. I decided to press on and took a quick look at the sections before riding them. My worst fears were soon realised when I came across the first deep river crossing. I decided to haul the bike across and once again was up to my waist in water. On the moors in the difficult conditions I soon began to appreciate the light weight of the machine and the effectiveness of the suspension. Once again I had to enter the sections in deep water but the machine never took any water in during the day, amazing. The steep drop down into Kinlochleven had me back down into civilization and I was quite relieved that the sections at Grey Mares Tail had been abandoned due to the water gushing down. Any rider attempting these steep hazards would have been a brave man! On the ride up to the group of sections named Upper Mamore the 280cc engine came into its own and made me realise when you are looking for a new machine it’s always worth trying both the 250cc and larger capacity machines. The 280cc is superb on the tracks and climbs and set me thinking that I must at some point try to have a ride on the larger capacity Beta. After struggling up the sections I quickly got on my way to the final group of the day at Sleubhaich. The superb engine literally pulled me up the sections with the machine leading the way as I was so cold and tired. Once again it had been a really hard day and I was not looking forward to the long hard day usually associated with Thursday. The ride back down into Fort William was at a pretty quick rate of knots as I just wanted to finish the day. When I got off the machine to hand it back to the Gas Gas support crew it just dawned on me I had just done possibly the hardest day’s trials riding in my thirty-odd year career! Disliked: Rear mudguard not effective. 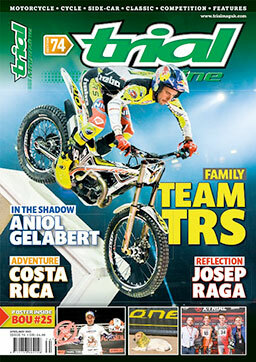 Trial Magazine would like to say a huge thank you to all the relevant suppliers of machines and equipment for the test. We would also like to thank Edinburgh & District Motor Club Ltd for allowing this test to happen.